Drivers across North Dakota and Montana rely on their trucks to get the job done, whether they rely on their ride for work or for recreation. The weather up here is extreme, necessitating the best truck protection to keep your investment safe after enduring the worst conditions. Those looking for the best, most rugged truck accessories can benefit from visiting our local truck shop for the best results. Alpine Truck Accessories is proud to provide a full range of off-road gear to protect your ride, and we are proud to be an authorized LINE-X dealer. This industry-leading spray delivers unsurpassed protection and years of UV-stable appearances, relying on minimal maintenance to continue to shine. That being said, maintaining your truck bed is still highly recommended! Today, we’ll discuss a few tips to ensure that your spray-in bedliner from LINE-X lasts for a lifetime. Be sure to contact us when you are finished reading to learn more about our top-notch products and services, and be sure to stop by our truck shop on 1st Street E for the best results! After picking up your truck from our LINE-X shop in Williston, you will be able to immediately benefit from the comprehensive protection of this polyurea coating. However, it’s important to remember that your LINE-X spray is not completely cured. Light-duty uses are fine, but we recommend waiting 24 hours before putting your truck bed to the test. Wait one day, and your vehicle will be ready for the rugged use and abuse this spray-in bedliner is designed for. Rocks, concrete, metals, heavy items, and a variety of chemicals can be placed in the truck after this cure window, so be sure to practice patience to receive long-lasting results. LINE-X installations are both fast and effective. If you’ve never considered this bedliner for your ride, feel free to call us to learn more! Routine care is simple thanks to the seamless finish provided by LINE-X coatings. This spray bonds to the bed of your truck at the chemical level, allowing for shining results after minimal care. Soap, water, and a bristle brush are perfectly suited to take off stubborn grime. Sweeping out the bed on a regular basis can also help to prevent the buildup of dust and debris. Any auto-grade soaps will suffice, as well as the services provided by automated and self-serve car washes. LINE-X is designed to provide optimal protection from stains and corrosion, but that doesn’t mean that you should neglect your truck bed. If you spill any chemicals or caustic agents in the back of your truck, our truck shop recommends picking up your spills in a timely manner to minimize any long-term risks. Leaving corrosive elements on the surface of your LINE-X coating may result in damages, so be sure you practice proactivity whenever you notice a spill! 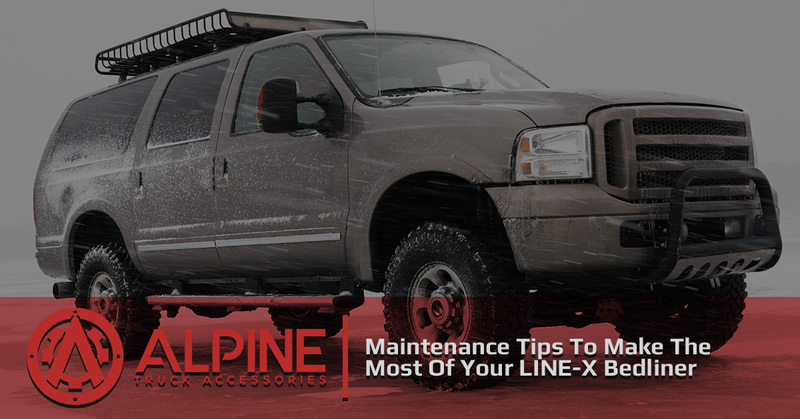 Alpine Truck Accessories is proud to offer a lifetime warranty with all of our LINE-X services, and we will be happy to offer fast and effective repairs if something does go awry. After daily wear and tear, the time may come to pressure wash your LINE-X bedliner. A simple once-over will provide a lasting shine that will show off the beauty of your ride, but be sure to exercise caution when using high-power machines. Concentrated streams at high pressures have the possibility of wearing down the finish of your LINE-X coating. Alpine Truck Accessories recommends setting your spray to a wide fan pattern for the best results. Our local truck shop strives to provide complete quality and peace of mind for all of our customers. We provide spray-in bedliners that are installed with precision and pride, ensuring that you are left with a bed coating that lasts a lifetime. Alpine Truck Accessories also provides a range of 4×4 parts and aftermarket truck accessories to ensure that your ride is outfitted for the rugged roads ahead. We offer a wide range of protective sprays and products to cover your entire truck from top to bottom with quality. For years, we have proudly served as Williston’s LINE-X dealers. Contact us today to learn more, and be sure to schedule your service!